View more documents from IN2marcom .com. Good Material to support our Marketing Plans. This Universal McCann research is conducted every year and this is the 4th Wave. Social Media is taking the web planet by storm but now is the time where it seems active internet users – those accessing at least every other day – are looking for the “one place” for their digital identity rather than spreading around various specialized social sites. 71,1% have visited a friend’s home page. We should provide these influencing people ways to populate their unique digital profile with ways to engage and maintain dialog with our brands in different form factors. Video is still the #1 form factor, but “instant UGM news” is ramping up as twitter‘s success attests and Facebook acquiring FriendFeed – that I started to use recently – reinforces as well. Fellow Marketers, I know I’ve been busy like crazy since a while but let’s believe that I’ll be back here with more regularity. I’ve been tracking Internet users growth since Scott McNealy, in one of his colorful keynote, reminded all of us that the Internet was still growing fast. Most of us in the western world do believe that Internet is a given but it’s growing still fast – 5M new users per week – and growing mobile especially in Asia. For us, marketers and software vendors, it must remain on our radar chart when we plan our campaigns and product roadmaps, especially when social networking is front stage. Why? Because more users on the net means more value for the network thus for the Internet, this is Bob Metcalfe law. It means more reach for any community every day. If this is accurate, then Web 2.0 is going to bring a lot of revenue on the table, not only VC’s, and Mobile Web 2.0 should as well. 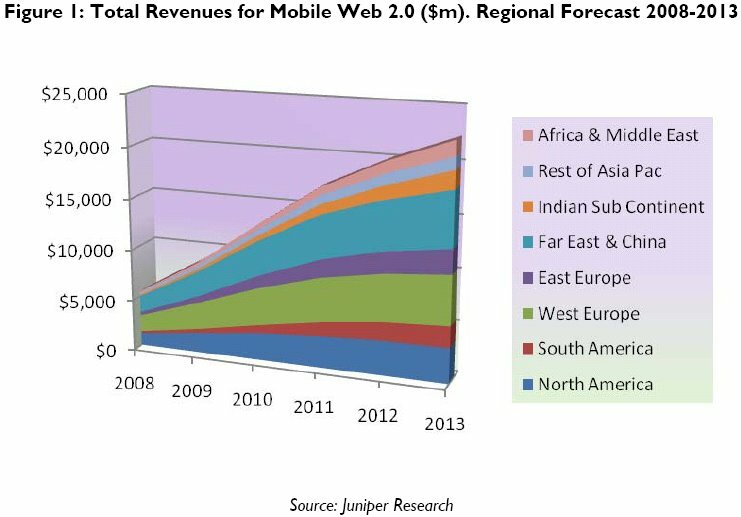 Juniper Research issued in May 2008 an interesting white paper stating that “Mobile Web 2.0 revenues to reach $22.4bn by 2013 driven by User Generated Content and Social Networking.” Point taken and much appreciated. Get ready for it. Web 2.0 burst year one i.e. 2007 was all about user generated content. Year 2 i.e. 2008 will be all about social networking and your multiple social networking identities management. More on this later, but you can double check Web 2.0 2008 conference keynotes that I did attend in San Francisco last April. I’m a recent facebook user. I knew about facebook for quite a while but I thought, as probably most of you, that it was a youngster phenomena. I’m no longer a youngster if anyone in doubt out there 😉 . This comes as no surprise as Facebook was created in 2004 by Mark Zuckerberg, Harvard graduate, and restricted at first to Harvard College students, then to other Boston area schools. More details on Facebook history here. On May 24, 2007, Facebook launched an API that allows the development of applications to be used on the site, known as Facebook Platform. A defining moment that illustrated one more time this web 2.0 postulate that the web is now an application platform. When inviting some of my friends to facebook, I sometime needs to explain to the most reluctant among them why this social network site is THE one. I think this ability to mashup tens if not hundreds of cool applications to leverage your friends network is sticky. It gives your facebook a constantly evolving face, a user interface typically webtop where users do refine it as they use it — see We’re moving from Desktop to Webtop. The real-time informations about your friends (mood, networks, events, …) gives it another reason for it to be addictive. Some of them even joined a group called “I facebook too much” demonstrating the addiction. As you can see in the Alexa graph, Facebook is on its way in 2007 to surpass the MySpace phenomena. More than the success of social networking as one of the Web 2.0 killing applications, I see it as a clear indication that mashups and webtop will prevail in the future. Fellow software vendors, take it as a home run. Enterprise 2.0 software should take this into account as well, as it will not remain a consumer phenomena. Large corporations do need social networking. In the coming months, we should see tremendous repositioning around this and some of the software vendors could just enter obsolescence allowing for a new software leaders generation. Beware! 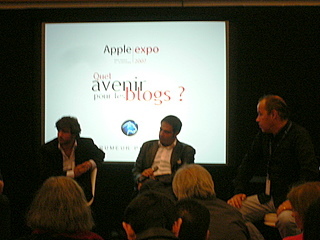 I’ve been spending an interesting afternoon at Apple Expo in Paris yesterday with my dear friend Christophe Ginisty. Beside being Apple’s PR, he’s also renowned for his blogging activity. He organized a debate about blogging future. Asking candid, or was it, questions about whether blogging is just a fading trend or a ramping up attitude. I tried to make a point there that I wanted to share with you. Blogging is to press media what video sharing (YouTube, DailyMotion) is to TV, and Music sharing (MySpace) is to Records. Blogs success in my opinion lies in the ability for anyone to publish articles without a financial equation supporting it and with very low barriers to entry. Blogging is free and easy (no web design skills required), to be compared with the press where audience must be as large as possible for advertising revenue to enable it, and where printing or broadcasting requires technical and financial muscle. The same is true for video and music production and distribution compared to the new free or close to free e-capabilities. Blogging, publishing music and video on the net doesn’t require a large audience either to be possible. It is enough to have a few hundred interested people and you can keep going. But adding up these very diverse communities of interest leads to a massive audience. This is the long tail opportunity that the net offers. To be compared to Business 2.0 magazine not publishing anymore, despite facebook community trying to rescue, by economic failure. So to me, all these individual contributions to the blogosphere, videosphere, photosphere and musicsphere are here to stay, widen and provide a huge creativity and freedom expression area without a capitalistic equation attached. We’re entering our last quarter of the year and we should be stepping back, before the final rush for ’07 revenue, to analyze this amazing year and its trends. Marketing, Business and the Web — Web 2.0 flavored of course — have never been more inter-weaved. This is why I called this Marketing 2.0 trends. 2. Rise of e-commerce: we’ve discussed the numbers earlier this year here on Marketing 2.0, and there’s no doubt e-commerce is no longer a fantasy but accounts for a significant part of the business either B2B or B2C. You cannot ignore it or consider it secondary. 3. Transparency: consumers demand relationships with brands mirroring the relationships they have in the real world and above all they demand transparency. Whether they’ll get this transparency from the brand directly or relying on user generated content to elaborate it, they’ll get it. If it’s the latter, your brand is in trouble. Remember: you don’t want to get Dell’d. 4. Community consumption: no longer do consumers rely on the press and vendors to choose. They increasingly rely on community advices for guidance. It is your job to influence communities, transparently please, as well as build your own communities. 5. Intangible real value: on top of it, we do buy virtual products and services for real money. Did you notice how many e-economy firms got the highest market caps? This goes generally with a positive buzz vortex on the web. You can no longer ignore your brand e-attributes and pay attention to e-competition. 6. 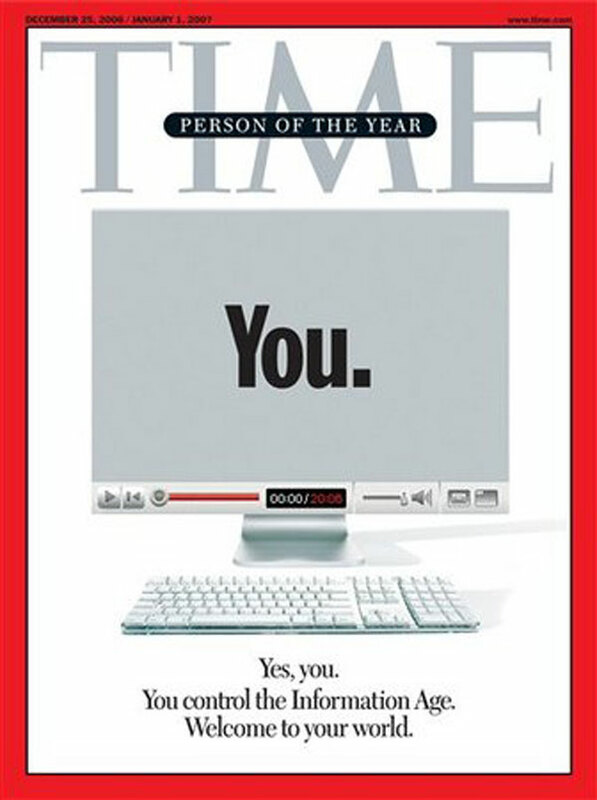 Meconomy: as the Time magazine cover once highlighted in designating the man of the year as “YOU”, consumers are focused on ‘me, myself and I’. Personalization, customization, customer centric are a must to succeed. And they’ll be asking this question: “what makes me happy?”. Yes, happiness has become a valued because increasingly out of sight. 7. Open for global business: there are no boundaries to memory anymore. You act local? We take it global. No one can anymore think its business strategy in isolation. The fast growing emerging economies (China, India, Brazil to name a few) unleashing new buying patterns and new global brands (Lenovo, Mittal, …) are already changing your plans. You’ll be selling there or be sold. My fellow marketers, what a thrilling world! Feel free to comment and contribute, we’ll be looking at this for the next few months. User-generated content and other web 2.0 trends, one would think, are mostly driven by teenagers and young adults. On the contrary. Here is an interesting research lead by Harrison Group (an independent research services firm) conducted from February through March 2007, showing that both the old and young generations enjoy reading magazines and are receptive to print ads. Additionally 51% of U.S. consumers are interested in watching and reading user-generated contents. This reinforces our belief that user-generated content is expanding its impact on several industries as media, software, music, videos, TV, … Stay tuned for more. By the way, let’s celebrate our first Marketing 2.0 birthday. It’s been already a year since I started my English-French blog about Marketing in the web 2.0 era. Thanks to you this blog is spanning its influence in many countries and I enjoy many more subscribers every day. Keep it growing. Thanks to you all.